Journalists embedded with the Peshmerga continue to gain firsthand experience with Improvised Explosive Devices (IED) employed by the Islamic State (IS). 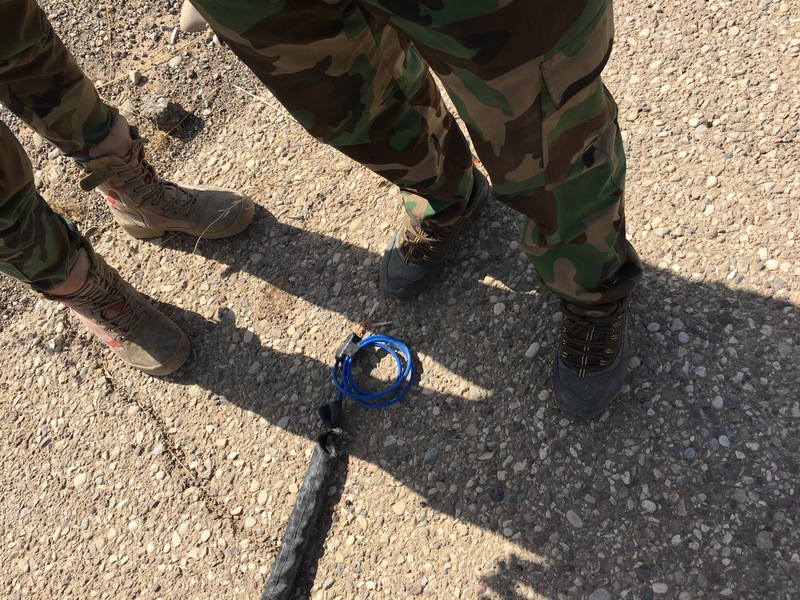 ARES received information from an embedded journalist detailing two designs of IED switch that are being encountered frequently by Peshmerga and Iraqi security forces in their continuing effort to counter IS in Hasan al Sham, Iraq. Both designs use pressure actuation to function an IED charge. Using the UNMAS IED Lexicon, these designs would be characterised as being victim-operated, denoting that the method of firing is performed by a switch operated by the intended victim of the device. Additionally, both designs use pressure-actuated switches. Where the two designs vary is the method of pressure actuation used to fire the initiation system. The first photo illustrates what would be characterised as a ‘plate type’ pressure switch wrapped in a rubber inner tube. A plate type switch is typically one which uses a natural air gap to hold open a firing circuit. When pressure is applied to either side of the upper plate, the resulting deformation closes the circuit and activates the switch. Most plate type pressure switch designs make use of flexible metal sheeting or similar readily-available items such as saw blades (commonly used for anti-personnel devices) or automotive leaf springs (for anti-vehicle devices). In these designs, the plates serve as both electrical conductors and pressure plates, simplifying construction. 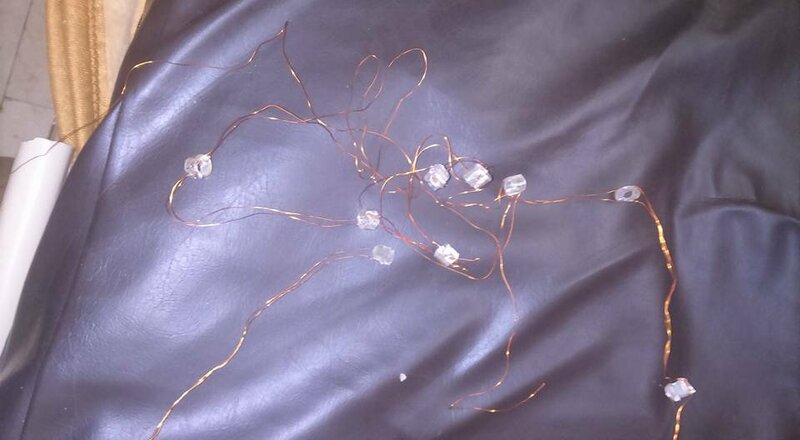 Other designs may use a wire backing on wood or plastic to electrically connect circuits when actuated by a target. More advanced designs incorporate components with a low metallic signature, such as carbon rods taken from battery cores. The majority of these switches are open electrical circuits but non-electric plate type pressure switches also exist. The sealed outer covering, most commonly adapted from tyre inner tubes, provides a degree of water proofing for the electrical connection and prevents any material lodging into the plate that would cause a malfunction. This type of switch, in particular, has been recovered in the hundreds from areas reclaimed from IS. The second photo shows two distinct switches of a similar type, generically known as ‘crush wire’ or ‘crush bead’ pressure switches. The term ‘crush wire’ is a misnomer, as the primary wire is not a part of one switch; instead, many switches are arranged along the length of wire in a series-parallel configuration, where the functioning of any one switch completes the circuit and functions the device. The switch in the background of the photo uses enamelled copper wire as the conductor throughout switch system. Each of the individual sub-switches along the length of wire employ a small section of plastic surgical tubing wrapped with non-insulated wire on all sides to create what is, essentially, a very small plate type pressure switch. This design is duplicated along the full length of the wire, typically at regular intervals, to create a physically small but long pressure switch. The crush wire switch in the foreground is constructed in a largely similar manner, with two distinct differences. Firstly, the switch uses a different wire as the base (possibly taken from telephone or Ethernet cable). Secondly, each sub-switch is protected by a layer of tape. Cutting either design of crush wire switch, a possible counter-IED technique in other circumstances, may close the circuit and function the device. 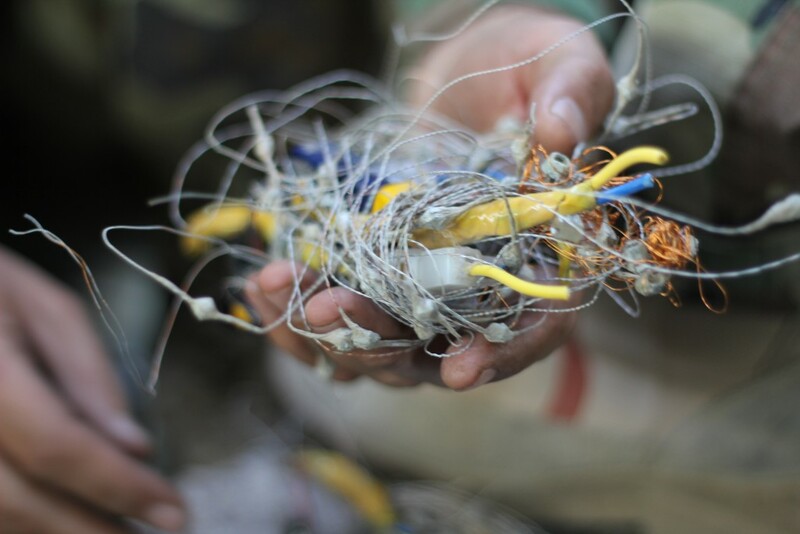 These two switch designs were recovered by the same team working in a single area of Hasan al Sham, which may indicate at least two different IS groups were manufacturing similar devices for use in locally-emplaced IEDs. Both the pressure plate and crush wire type design concepts have a long history, particularly in Iraq, with examples being found on numerous occasions. IS may also be exporting these designs to other regions, with examples of similar switches located in Libya in August 2016 (see image below). Both are reasonably easy to manufacture en masse by personnel with minimal training. These simple and effective types of switches are likely to continue to plague counter-IS forces and returning civilian populations in formerly IS controlled areas. Special thanks to Sophia Jones of TheWorldPost.